Do you believe the rumor of Central Bankers Intervention ? One thing I don't understand why does the rumor comes in last hour of trading ? Its always from secret source. Anyways automatic computer trading or so called Super computer doesn't differentiate whether its real or rumor. And even if you decide to take action, market is already up or down by 50 - 100 point in no time. I still don't believe central bankers can take action till market falls below 11k or US dollar Index rises above 85. Today's rumor was to prevent panic ahead of Greece election and divert the mind from bad US economic data and Egan Jones downgrading France rating. 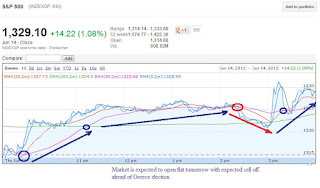 Today's rumor also made sure that S&P500 stayed away from 1309 level which is 200 MA ahead of Greece election. 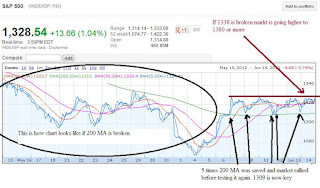 Below is the chart which shows what happened in May when S&P500 broke 200 MA. So far Central banker have printed over 6 trillion There is no doubt market will go higher if central banker provide liquidity support. But don't buy bullish stocks on the hope and wait till its really done. This doesn't mean you have to play defensive. Look at the chart and trade on fundamental basis. 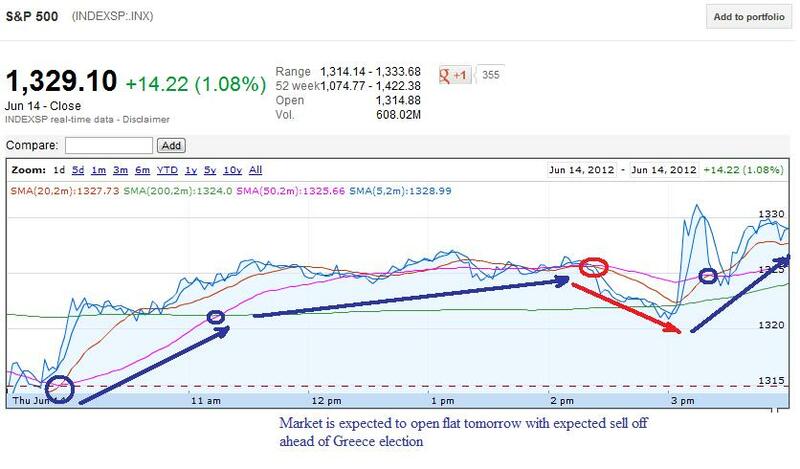 Based on the chart tomorrow, market should open flat and close low. Expect volatility to rise. So watchout UVXY, VXX and TVIX. 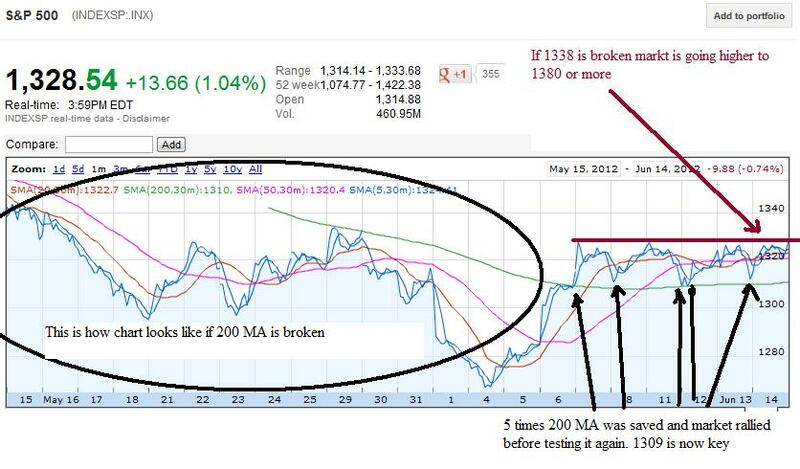 For Bullish sentiment to continue: Dow needs to break 12670 while S&P500 needs to break 1333.